Score another win for the little guys. Zotac’s famous for its army of small form-factor PCs, and indeed we found a legion of them at the company’s CES 2017 suite—everything from tiny PCs powered by Intel’s new Kaby Lake chips to slightly larger (but still small!) gaming-ready rigs packing Nvidia’s GTX 1070, GTX 1080, and even full water-cooling setups. But what stood out the most were two pieces of hardware designed to bring even more gaming power to ultra-tiny PCs: a new graphics card enclosure and the world’s first-ever mini-ITX GeForce GTX 1080. Let’s start with the graphics card. GTX 1080s are nothing new, but you’ve never seen one quite like this. 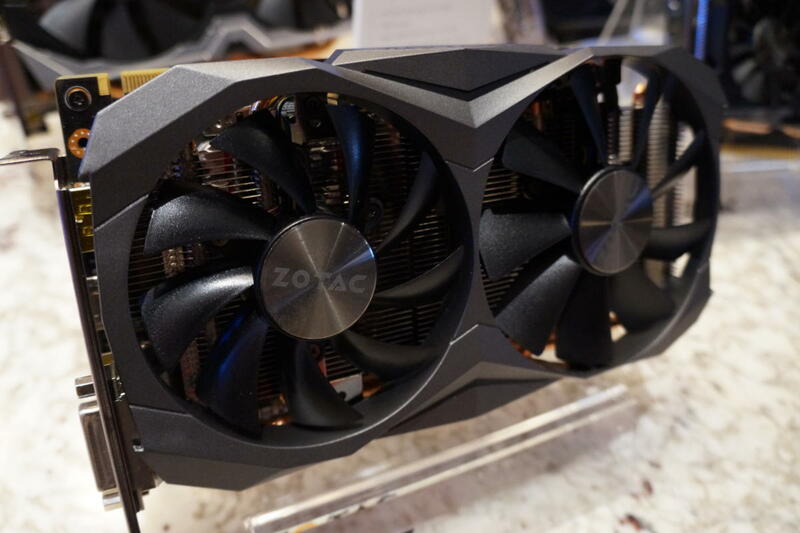 The aptly named Zotac GeForce GTX 1080 Mini is a full-fat GTX 1080—heck, it even sports a very slight overclock, to 1,620/1,759MHz base/boost speeds—shoved into a tiny dual-fan package measuring a mere 8.3-inches long. Cramming that much power into that tiny space required Zotac to create a custom PCB with a 5+1 phase VRM. Cooling-wise, the Zotac GTX 1080 Mini features an aluminum radiator with thick, long copper heatpipes snaking throughout, as well as a pair of fans that are different sizes, curiously enough. 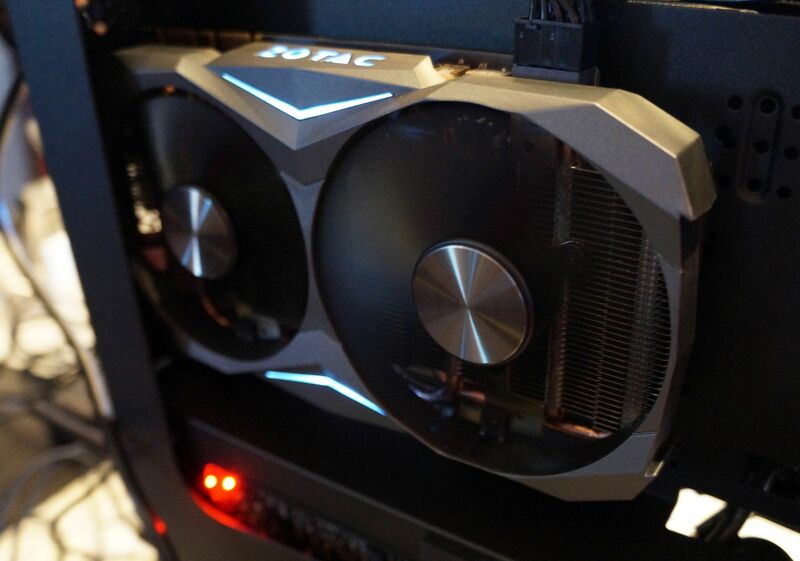 A Zotac representative told me that since this graphics card was designed for smaller rigs, the left-most 90mm fan is designed to keep static pressure under control, while the right-side 100m fan keeps heat down. Aiding in the quest for coolness is the all-metal design of the card, which extends to both the shroud and a nifty-looking backplate that ditches Zotac’s signature bright-yellow slash for a more subdued gunmetal color. The GTX 1080 Mini running in Zotac’s suite was surprisingly quiet even in a case without its side panel on. Exciting stuff. 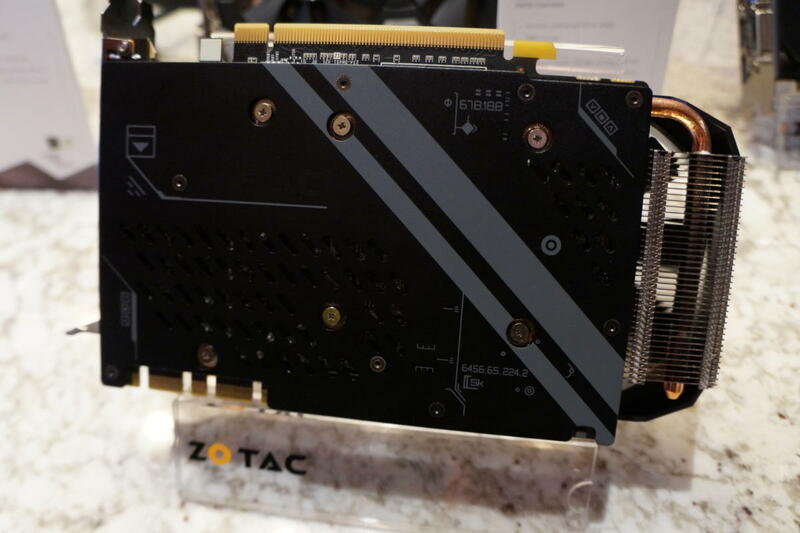 Zotac expects the GTX 1080 Mini to launch soon, and hopefully we’ll have a review ready for you when it does. 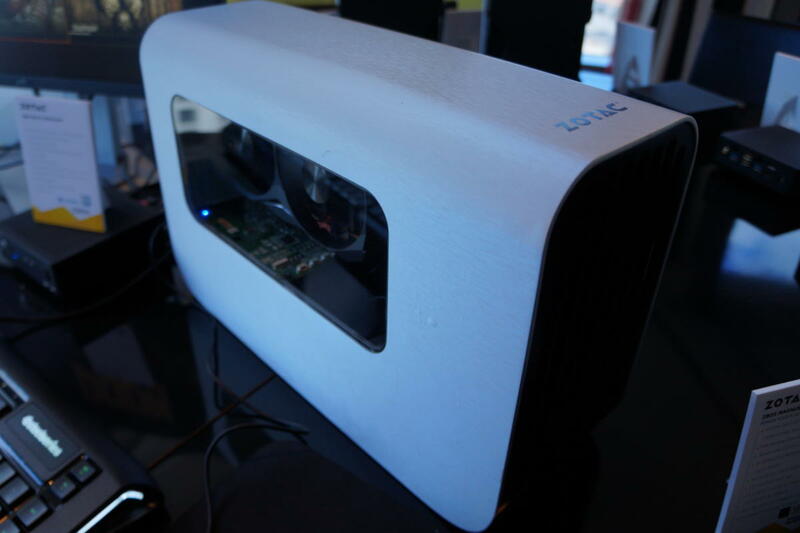 Zotac also revealed an early prototype of a new product that ties its mini-PC and graphics card strengths together: an external graphics card dock. The prototype was so early that the exterior of the enclosure contained blemishes you should ignore, and it’s not in the gunmetal gray that Zotac plans to use on the shipping product. Nor did it pack the internal fans you’ll find in the eventual consumer model. 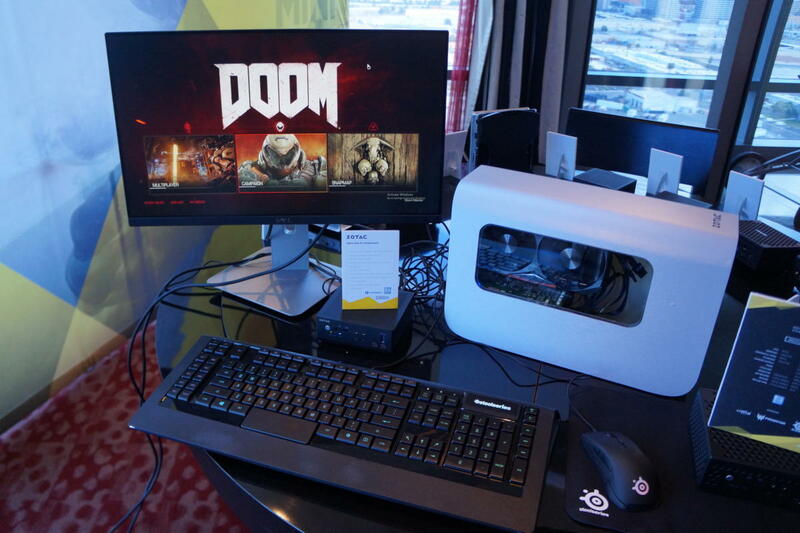 But even in the rough early state, the dock functioned well enough to help a tiny Zotac Zbox MI549 mini-PC with integrated Intel graphics run Doom like a champ, augmented by the power of the aforementioned GTX 1080 Mini. Zotac’s prototype connects over Thunderbolt 3 and will work with any laptop or PC that also features the (still relatively rare, but becoming more common) port. It’ll hold even gargantuan graphics cards up to 13-inches wide and three slots thick, and Zotac’s bolstering the graphics card enclosure’s usefulness by packing in a trio of USB 3 ports along with a dedicated USB Quick Charge connection to power up your mobile devices in a jiffy. The final design of Zotac’s graphics card enclosure still seems a bit up in the air, as representatives were asking me what I thought of various additional value-add features. Nevertheless, the company hopes to ship these sometime in the first half of 2017.